Since the IRS is currently revising Form W-4 to reflect changes made by the new law, the 2018 Form W-4 may not be released until after February 15, 2018. However, the 2018 withholding tables in IRS Notice 1036 are designedto work with the existing Forms W-4 that employees have already furnished their employers. Normally, employees must refile their Form W-4 with their employer if they experience a change in family status that decreases the number of withholding allowances they can claim. The IRS is suspending this requirement until 30 days after the 2018 Form W-4 is released. Employees may update their withholding at any time in response to the Tax Cuts and Jobs Act. All these changes will create a lot more work for employers still using paper-based Federal and State Tax forms. That is why ADP has recently made electronic Tax Withholding Forms available in Workforce Now, allowing employees and employers to take advantage of easy online self-service. Our current Payroll clients do not have to take any action as HR Knowledge will be implementing the self-service capabilities for your employees automatically. If your employee’s withholding information was previously entered in Workforce Now, the employee can use the new self-service electronic form to view their current withholding and make any necessary changes in accordance with the new Tax Cuts and Jobs Act. Your Client Account Manager will be reaching out to you to confirm the self-service tax forms have been made available, so you will no longer need to provide us with the paper tax forms when sending over new hires and will no longer need to use the paper forms for your employees to make changes as they can make those changes through the self-service portal. 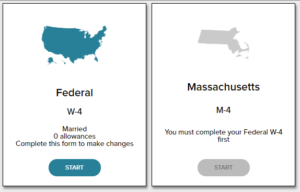 If you are a Payroll Client using the ADP RUN system, you will need to continue to use paper forms; as soon as the new 2018 Federal Tax Form is released, we will update your paper new hire kits on the ShareFile portal.